She was born on the 4th of July. Mother didn't want her, but the wild west did. She left suburbia early, she knew where she belonged. Her favorite date is a ride through the desert on the back of a motorcycle and blueberry pancakes at a cheap diner. Parliaments, black lipstick, guarders, guns, cactuses, cars and cowboys. She was tougher than raw hide, wilder than a fox and sleeping in bear skin. The girl that stole the keys to your bentley but rides a harley. She doesn't have time for the fuss. When she says lets ride, she means it. Blonde of all trades, ace of hearts. Tousled hair and untied laces, making friends with the officers at the city of Los Angeles Police Department. Sometimes she just needed a little city hall in her life. She was always on the lookout for something wilder than herself. Freedom was in her blue eyes and mother said she was born bad. She was a blonde. Here is one of many little teasers that are to come from a book coming out by Emily Siegs of barbierawk.com and me. 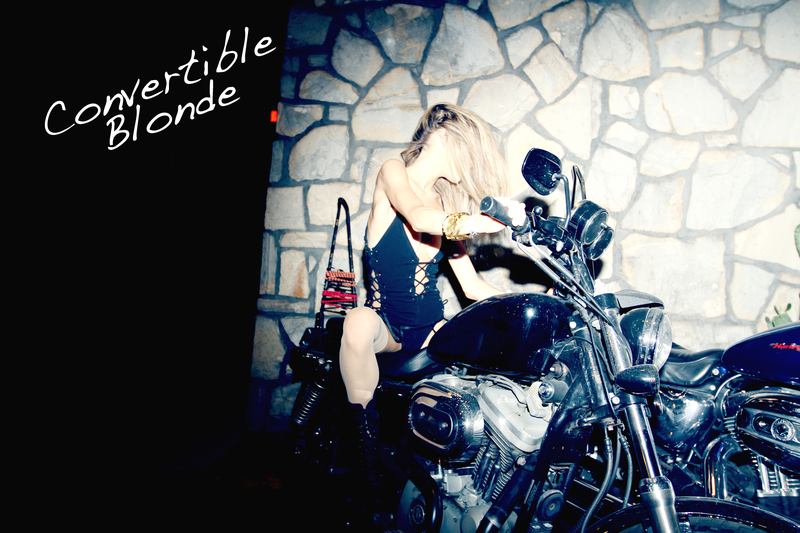 It's called Convertible Blonde and is for every girl. We use the word blonde, but really this is for any girl that's ever misbehaved, any girl that's ever stolen something when she had the money, any girl that ever ran from the law, and liked it.